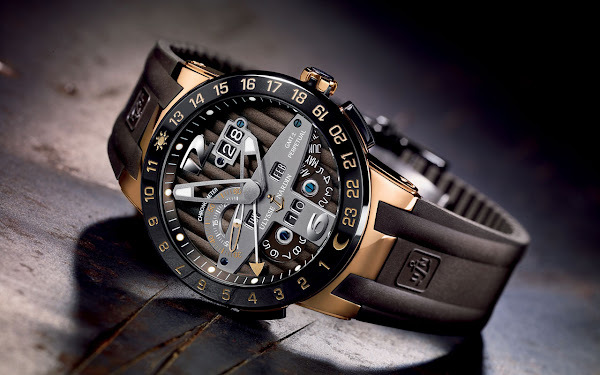 Luxury Cars and Watches - Boxfox1: Ulysse Nardin El Toro - A powerful Timepiece for everyday use. Ulysse Nardin El Toro - A powerful Timepiece for everyday use. The striking aesthetic of El Toro combines modern materials with a timeless dial design that inspired its name. The bezel and pushers are made in ceramic. The squeletted hands permit easy reading of all calendar functions and the sapphire caseback allows to observe the mechanics of time. • The only perpetual calendar that adjusts forward and backward in seconds over the quick corrector position of a single crown, even in the year 2100. • The hour hand is adjusted instantly to a new local time with pushers (+) or (-) without taking the watch off the wrist or interfering with its time keeping. • The arrow keeps track of one’s home or reference time. • The oversized date, the day, the month and the year change instantly forward or backward when the hour hand is moved to a new local time across the dateline with pushers (+) or (-). • The white gold rotor ensures that the watch is automatically wound with a power reserve of 45 hours. The Perpetual GMT± undergoes the rigorous tests of the Swiss Official Chronometer Control, certifying to the reliability and accuracy of this exceptional timepiece. Available in a Limited Edition of 500 pieces in 18 ct red gold and platinum. Winding Self-winding with COSC certificate. Functions Perpetual Calendar adjustable over single crown. 2nd Time zone on main dial with a patented quick setting mechanism. Permanent home time indicated by 3rd hand. Big date in double window. Band rubber strap with titanium/ceramic deployant clasp; leather strap with folding buckle.